Inc. Magazine today ranked GiftCardRescue.com, an industry leading gift card exchange service, on its 33rd annual Inc. 500|5000, an exclusive ranking of the nation’s fastest-growing private companies. GiftCardRescue.com is proud to be recognized as a leader in the Consumer Products and Services industry on the prestigious 2014 Inc. 5000 list. Inc. Magazine today ranked GiftCardRescue.com, an industry leading gift card exchange service, on its 33rd annual Inc. 500|5000, an exclusive ranking of the nation’s fastest-growing private companies. GiftCardRescue.com was ranked No. 1039 overall and No. 12 in the Baltimore Metro Area. The list represents the most comprehensive look at the most important segment of the economy—America’s independent entrepreneurs. Companies such as Yelp, Pandora, Timberland, Dell, Domino’s, LinkedIn, Zillow, and many other well-known names gained early exposure as members of the Inc. 500|5000. 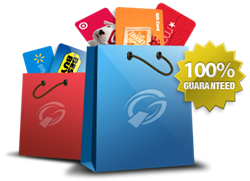 GiftCardRescue.com helps consumers unlock the value of their unwanted gift cards, as well as, save more money when discounted gift cards are stacked with store coupons and promotions. Consumers can get up to 92% cash back for their unwated gift cards and save up to 40% on discounted gift cards to over 450 major merchants. The three-year growth rate of 428% and 2013 revenue of $10.1 million directly reflect the company’s growing popularity among consumers. CONTACT: Business & Marketing Manager, Carrie Brenner, at 410-220-0398 or carrieb(at)giftcardrescue(dot)com for additional information on GiftCardRescue.com.